My students were working on this tiling puzzle one day when an administrator walked into my room. The comment from that administrator was “Wow, this really gets them thinking!” Her comment was so spot on. The reason that I created this Division Tiling Puzzle was to get my kids to truly think about math, numbers, operations and how it all works together. Most students don’t simply become critical thinkers on their own. We have to help them out a little bit. This puzzle allows me to push my students out of their comfort zone and help them to look at math in a very different way. 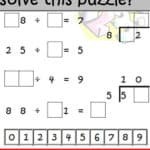 So, if you want to really get your kids thinking, download this free puzzle from my Teachers Pay Teachers store.